Military traditionalists and aviation fan boys, you might need to sit down for this: In its zeal to stay relevant and (sort of) save bucks, America’s flying corps is ridding itself of some of its cheapest, most reliable attack jets in favor of an overpriced, underperforming boondoggle of an aircraft. The Air Force announced plans on Friday to cut five squadrons of A-10 attack jets (as well as a number of cargo aircraft) in the hopes that they’ll ultimately be replaced by the notoriously expensive F-35 fighter program. The plan is bound to be controversial. Imagine an unstoppable commercial Learjet with a full-automatic cannon in its nose and an iron bathtub surrounding the cockpit. That gives you some idea of the A-10’s appearance and performance. Nicknamed the Thunderbolt (though most salty service members call it a Warthog, since that nose cannon kind of looks like a snout), the A-10 was developed in the Cold War to fly low and slow and destroy Soviet tanks. 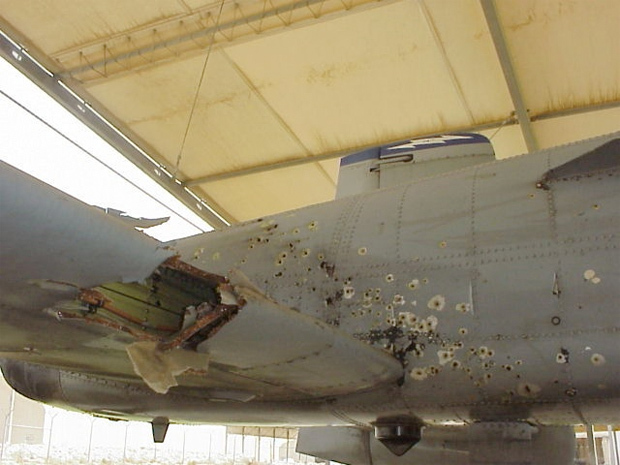 After 9/11, war planners realized the A-10’s close-air support capabilities made it an ideal tool to defeat insurgents, too; by 2010, 60 of the planes had fired more than 300,000 rounds of ammunition in combat over Iraq (as well as flown a handful of propaganda-leaflet drops), with an 85 percent success rate [PDF]. The plane has done equally well in Afghanistan and Libya. But more than that, the A-10 gives the US an enormous bang for its buck, and a decent environmental deal to boot. It boasts large-surface-area wings and turbofan engines, like commercial airliners, that are much more fuel-efficient (and slower) than supersonic military turbojets. 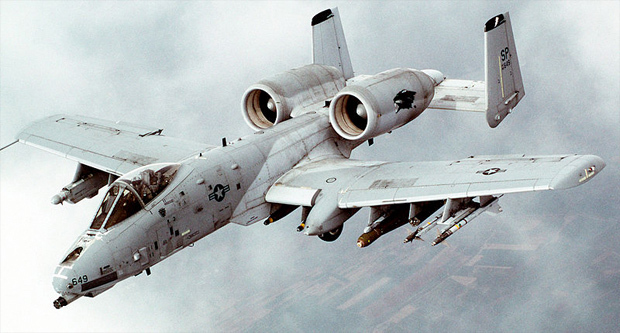 The military even began using biofuel to power the A-10 two years ago. At max power, the A-10’s engines are at least five times more fuel-efficient than its future replacement, the F-35—which is supposed to be an air fighter and a ground attack plane, but doesn’t perform particularly well at either task. So why is the Air Force ditching an inexpensive single-use platform in favor of a gold-plated aircraft that doesn’t do particularly well at any of its missions? Part of the decision is strategic: The US is changing its focus from the Iraqs, Afghanistans, and Libyas of the world to conflicts between major powers, particularly in the Pacific—not an imprudent strategy, since the military’s attention and production lines have been focused on bombing individual bad dudes in Toyota pickups for a decade now. We have plenty of weapons to deal with insurgents (for example, drones, cruise missiles, and other aircraft), but an A-10 flying 300 miles an hour and turning like a 727 isn’t suited to combating China’s, Russia’s, or North Korea’s supersonic jet fighters. The real driver in this decision is political: A relatively cheap and low-tech aircraft doesn’t help the Air Force justify huge future budgets; the luxury price tag of the F-35 does. And Congress wants the F-35, like, really bad. So bad that “budget hawk” congressmen like John Boehner were stepping over each other to get funding for an alternative engine the plane doesn’t even need. And for the Air Force, A-10 units are easy to cut: They’re mostly National Guard units that operate semi-autonomously until they’re activated for overseas deployment. In other words: We’ve got an overpriced-weapons gap! And that’s how Lightning trumps a Thunderbolt—at least until America’s next “small” war comes.